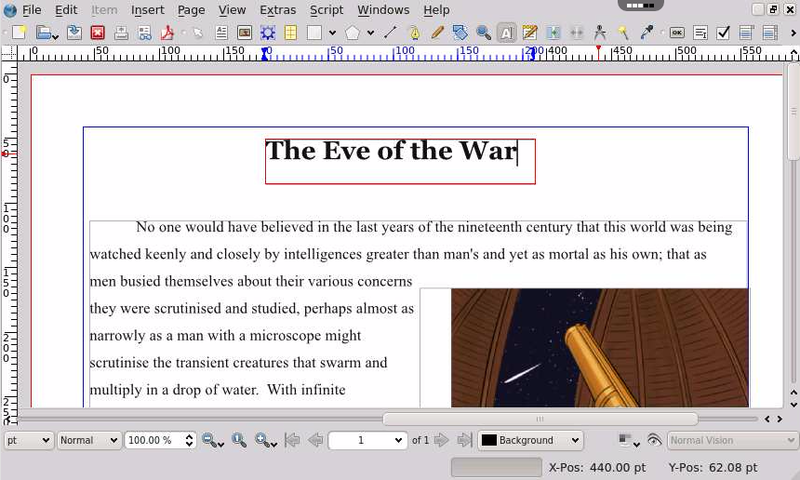 Scribus is one of my favourite apps, and has been for years. I use it all the time, and I have literally hundreds of documents created with this fantastic software. But this online version is far too slow, which makes it very difficult to use for anything other than the very simplest of documents. This is a great shame, because being able to use this app on my Chromebook is one of the main reasons why I have a subscription to Rollapp. Scribus supports most major image formats including scalable vector graphics (SVG). 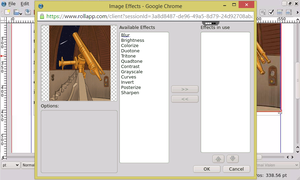 Professional type/image setting features include CMYK colors and ICC color management. It has a built-in scripting engine using Python. Printing is achieved using its own internal level 3 PostScript driver, including support for font embedding and sub-setting with TrueType, Type 1 and OpenType fonts. The internal driver supports full Level 2 PostScript constructs and a large subset of Level 3 constructs. PDF support includes transparency, encryption and a large set of the PDF 1.4 spec as well as PDF/X3, including interactive PDFs form fields, annotations and bookmarks. While PDF export is very good, it is not currently able to import/edit PDF files, and PDFs exported from Scribus 1.3.3.x and earlier are not searchable in Acrobat Reader if the fonts were outlined/subsetted as vector objects. The file format, called SLA, is based on XML. 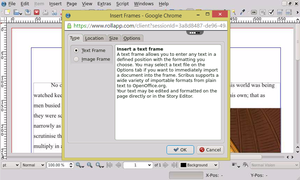 Text can be imported from OpenDocument text documents, as well as OpenOffice.org Writer, Microsoft Word and HTML formats (although some limitations apply). This app is super! You just have to actually learn it, and/or have some computer layout experience to know what you've got. You'd never have a cost-matching need for InDesign with this app in your reach. pretty good free substitute to PageMaker !